Want a little down time in the kitchen? Some relaxing uses of essential oils and aromatherapy include using them to flavor or bring out aromas in food. 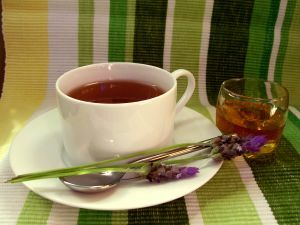 In an article about aromatherapy in the kitchen, I found two recipes that look like a wonderful addition to a post-massage evening. Click through to the link to find out more about specific essential oils used for relaxation in aromatherapy. To a 16 ounce (one pound) jar of honey add three drops of bergamot essential oil and stir with a spatula. Store in a cool, dry place and use a teaspoon of honey in a cup of your favorite Earl Grey tea. If honey crystallizes simply warm it in a tub of very hot water – do not microwave the honey! Remove your ice cube trays and measure the amount of water required to fill them. In this water use a ratio of one cup water to one heaping tablespoon fresh or dried lavender buds. Fill the trays and return them to the freezer. Store ice cubes in a zip-top style freezer safe bag for easy access. Float a couple of lavender cubes in a glass of lemonade, wine spritzer or another favorite summer drink. Put your feet up and relax. via Relaxation and Stress Reduction in the Kitchen with Aromatherapy | Suite101.com. Tuck some lavender into a few ice cubes before your next massage in Louisville or Nashville and give yourself a post-massage treat.